I am happy I belong to the hordes of PostGIS users. 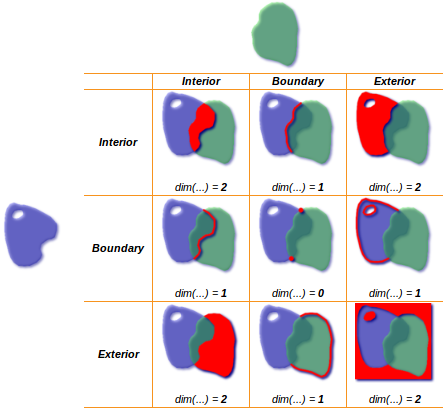 Recently I asked for a very small addition to the PostGIS manual that will explain the three basic terms of the geospatial geometry: interior, boundary and exterior. Kevin Neufeld delivered a very well written chapter about Dimensionally Extended 9 Intersection Model (DE-9IM) with series of excellent visualisations of the non-trivial mathematics. Moreover, Kevin started completing the PostGIS Functions Reference with visual presentation of geometric problems together with SQL commands using various PostGIS functions that can be applied to solve particular situations. For example, what does the ST_Buffer function, how boolean predicates like ST_Contains check spatial relation of two geometries or what’s the difference between ST_Difference and ST_SymDifference. Clearly, I’ve got way way more than I asked for or I expected. On behalf of myself and users who are about to start their adventure with PostGIS, I’d like to give big kudos to Kevin for this fantastic work! Together with the recently documented PostgreSQL PostGIS Types and Function Support Matrix, PostGIS team is making abrupt manual a pleasant reading book.